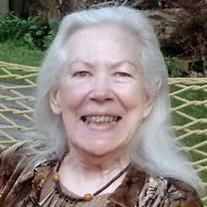 Elisabeth Travis Dreyfuss, MA, JD, died at home on December 17, 2017. Elisabeth was born at Huron Road Hospital in Cleveland, Ohio, on April 17, 1935. She grew up a happy child on Lincoln Boulevard in a house her parents bought for $1000 with a GI bill mortgage. Early on, her family gave her the nickname "Ducky," which she carried proudly throughout her life, along with her own talent for making special names for those she loved. Her childhood sparked her lifelong passions for books, art, radio broadcasts of baseball games, and engaging discussions about history and civil society. She was a proud graduate of Cleveland Heights High School where she first met Michael Dreyfuss, her husband of 58 years. She received her undergraduate degree from Allegheny College in 1957, where she learned to love high heels from the French exchange students studying there. Through Allegheny, she also studied at the University of Edinburgh and her time in Scotland was an important touchstone throughout her life. She earned her MA in history from Case Western Reserve University in 1959 and her law degree from Cleveland-Marshall College of Law in 1978. Before coming to Cleveland-Marshall, Elisabeth was a teacher and a curriculum specialist for the Cleveland Heights-University Heights School District and a lecturer in history at Adirondack Community College in New York state. From 1979 through 1995 Elisabeth was Assistant Dean for Community Education in the Law, and Director of the Street Law Program at Cleveland-Marshall College of Law. She was drawn to Street Law because she saw that knowledge of the law could be valuable to students and youth who struggled with the hazards of growing up in troubled times. Street Law could help this group of youngsters be safer and more productive citizens by teaching them about their rights within the law, and it could set them on course for law-related professions. She held a deep knowledge of history and a passion for current affairs, local and international, and freely shared her insights to engage others to share her interest in justice. Through her work with Street Law, she taught law students the skills they needed to teach fundamental principles of law to primary and secondary students across Northeast Ohio. These included mediation and non-violent dispute resolution, and offered students opportunities to participate locally and nationally in mock trials. She is credited with institutionalizing law-related education at Cleveland-Marshall and in Ohio. Elisabeth served for many years on the national Street Law Advisory Board and was honored for her enthusiastic replication in Ohio of the clinical Street Law program pioneered at Georgetown University School of Law. In 1983, Elisabeth joined with Peter Gale, Nona Burney and Judith Zimmer to develop the concept and design the curriculum for Cleveland's Martin Luther King Law and Public Service Magnet High School. She described the 4 years she worked with the magnet high school as among her proudest times because, as she told her family, "graduates moved into the middle class with successful lives and happy families." She often highlighted the positive results of involving students in school governance and argued that traditional discipline policies obstruct student ethical development. Involving students in resolving conflicts, Elisabeth believed, helped them mature ethically and to become engaged with their school community. In 1993, Elisabeth was invited to lecture on her work to the law faculty and students at Addis Ababa University in Ethiopia. Elisabeth was a founding member of the Cleveland Artist Foundation and a tireless promoter of the artwork of her father Paul Bough Travis and his colleagues in the Cleveland School. She also served locally on the boards of Cleveland Works, The City Club of Cleveland, and the Alcohol and Drug Addiction Services Board of Cuyahoga County and nationally on the board of Amnesty International USA. She served as president of the board for The City Club of Cleveland in 1989 and Amnesty International USA. Elisabeth loved her friends and family deeply. She always had time for her grandchildren, to put together a puzzle, play a game of chess, ask a probing question, listen to a tune ... or just listen. Elisabeth was preceded in death by her beloved husband of 58 years Michael "Doc" Dreyfuss, her parents Paul Bough Travis and Margorie Lucy Travis (Penfield), her sister Jane Travis, and her brother William Penfield Travis. She is survived by her children John Henry Dreyfuss and Kyle Dreyfuss-Wells (Kevin); her nephews Gregory R. Travis and William Phillips; her nieces Elisabeth Sunday and Jessica Travis Serra; and her grandchildren Lily and Lucian Dreyfuss, and Fenner Dreyfuss-Wells. Elisabeth was much loved by her family and many friends. The family prefers that any contributions in her name be made to The City Club of Cleveland (cityclub.org), Street Law, Inc. (streetlaw.org), or Amnesty International, USA (amnestyusa.org). A memorial celebration will be held at 5:00 p.m. on January 19, 2018 at The City Club of Cleveland 850 Euclid Avenue, Cleveland, Ohio 44114.